H/T to my colleagues from Prep Baseball Report Illinois for tweeting a link to this video earlier today. 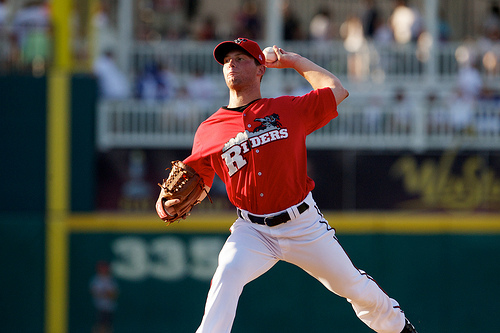 Connor Powers was the 2006 PBR Illinois Player of the Year and currently plays in the San Diego Padres organization. It is hard to still think of Rizzo as a rookie after he was punished to the tune of a .523 OPS for the Padres in 128 at-bats in 2011. He still qualifies for this list, though, and while his stock did take a hit, he still is one of the top corner bat prospects in the game. 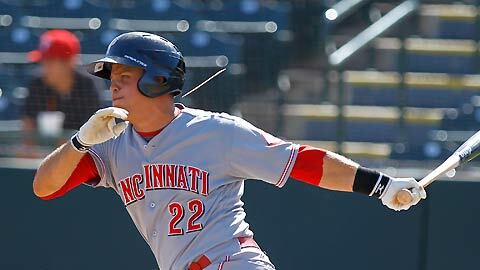 As soon as he was demoted to Tucson, he began raking again, slashing .331/.404/.652 with 26 jacks in only 356 at-bats. He has true 60-grade power today with a chance at more. His bat gets long to the ball, a tendency that lefties have had a fairly easy time exploiting, but he is athletic enough to develop his hit tool to a point that he should be able to stay inside of more pitches. Rizzo is an elite defender at first, but will never be an average runner. Who cares? With time, the 22-year-old could develop into one of the top first basemen in the National League and makes the loss of Adrian Gonzalez considerably more tolerable. He was the top offensive prospect in Boston’s organization before he became the centerpiece of the Gonzalez deal last winter. 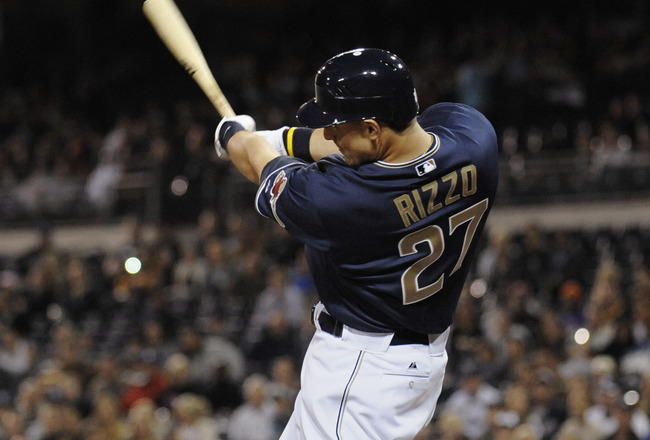 After the Mat Latos trade, the Padres are several pieces away from a legitimate chance at contention, and they have a very bright youngster with a chance to hit in the middle of the order for years in Anthony Rizzo. Erlin was the prize of the Mike Adams deal, and he is perhaps the most unique pitcher of the Top-50. While many of the elite arms on this list have blazing hot fastballs and need to come up some in terms of commanding pitches and developing useable third pitches, Erlin already has plus secondary offerings and command. His breaking ball has terrific shape as does his changeup, and he locates both nearly as well as his fastball. His fastball works in the 88-91 mph range, but can reach 93 mph when he lets one go. Erlin gets great plane on his pitches despite only being 6-foot, and has fluid, repeatable, and athletic mechanics that should keep him healthy. His 2.99 ERA across two leagues (including 16 starts in the Texas League) and 154 strikeouts in 147.1 innings reflect just how dominant Erlin can be despite not having prototypical ace stuff. He only walked 16 guys all season, and despite a bit of a propensity for flyballs, Erlin projects as a very solid No. 2 option in the Show. In a yard like Petco, it is quite reasonable to expect Erlin to perform like a No. 1. We expect him to make at least 10-15 starts in Triple-A before being called up, and he will have to continue to prove that his command is good enough to overcome a lack in pace, but we expect him to stick in the Padre rotation for years.